VoIP systems have a reputation as some of the most high-maintenance systems in networking. VoIP phone systems have minimal tolerance for poor performance as just a little latency and packet loss can have a devastating impact on audio quality. Using VoIP monitoring tools is the only way to make sure that your network can support VoIP systems. With VoIP monitoring tools you can measure connection quality within your network to make sure that your phone calls aren’t experiencing choppy audio. 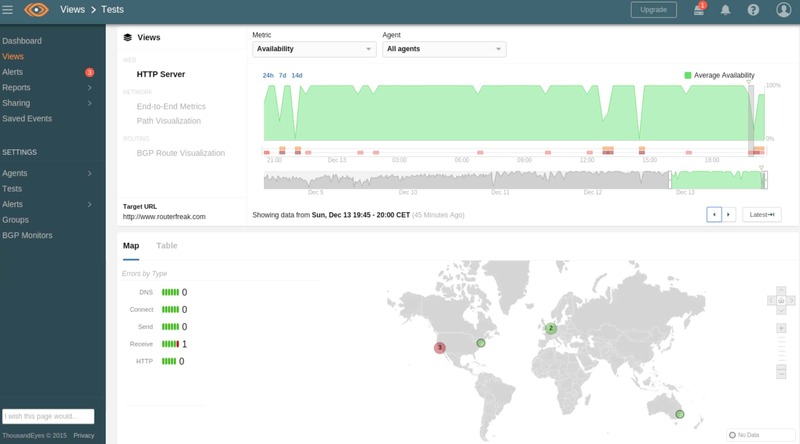 Crucially a VoIP monitoring tool will allow you to see how much latency and packet loss is present on your network. 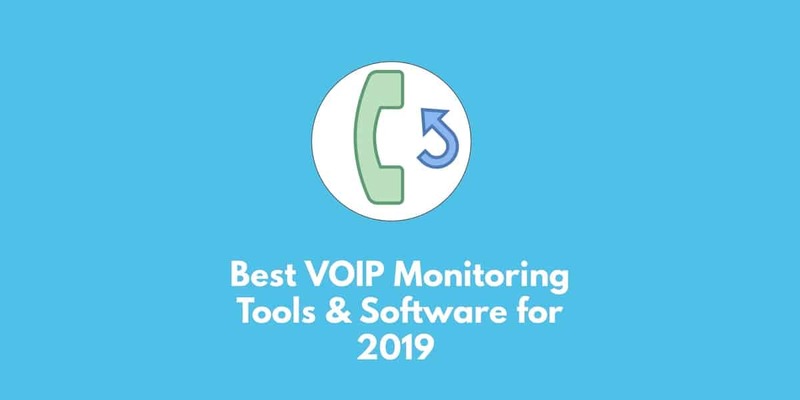 In this article, we’re going to look at the best VoIP monitoring tools and software for 2019. First up on this list we have SolarWinds VoIP and Network Quality Manager. 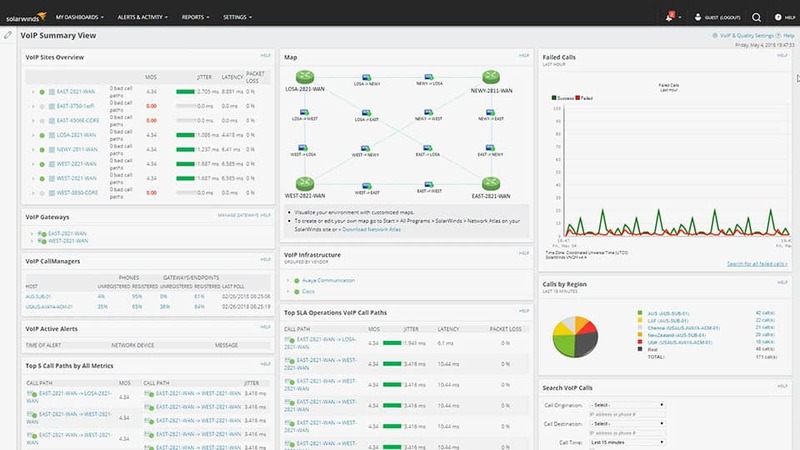 SolarWinds VoIP and Network Quality Manager allows you to monitor VoIP call performance and WAN performance. VoIP metrics that you can track include jitter, latency, Mean Opinion Score (MOS), and packet loss. These metrics tell you if VoIP calls are being delivered with poor quality. In the event that you need to run extensive troubleshooting you can go through your call records to find information that can show you what is causing poor performance. You can search for calls by call origination, call destination, call manager, call time, call status, and call quality. This helps to move the troubleshooting process along quickly. SolarWinds VoIP and Network Quality Manager is accessible to organizations because it offers a simple user interface and it can be deployed in less than an hour. Deployment is fast-tracked because the platform automatically discovers Cisco IP SLA-enabled devices. 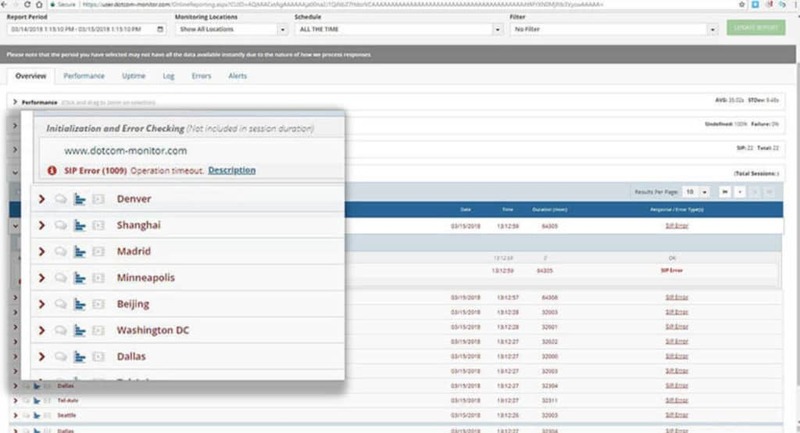 Autodiscovery means that the user doesn’t have to configure everything manually. Overall SolarWinds VoIP and Network Quality Manager is a choice that is suitable for organizations of all sizes looking for a VoIP monitoring tool. SolarWinds VoIP and Network Quality Manager starts at a price of $1,602 (£1,225). PRTG Network Monitor is a network monitoring tool that offers a VoIP monitoring experience with free QOS and IP SLA monitoring. 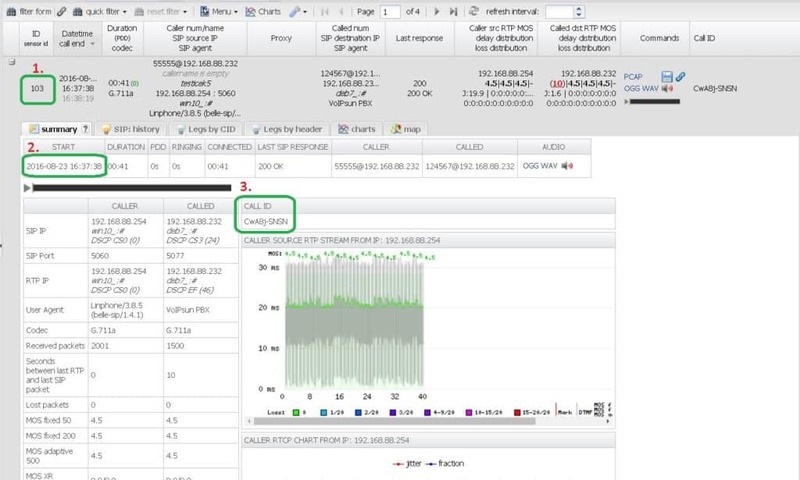 QoS monitoring with PRTG Network Monitor takes place with the PRTG Round Trip Sensor which measures latency, jitter, packet loss, duplicate packets, and Mean Opinion Score. Likewise there is a Cisco IP SLA Sensor for monitoring Cisco device data. The wider monitoring experience is completely personalizable according to your requirements. 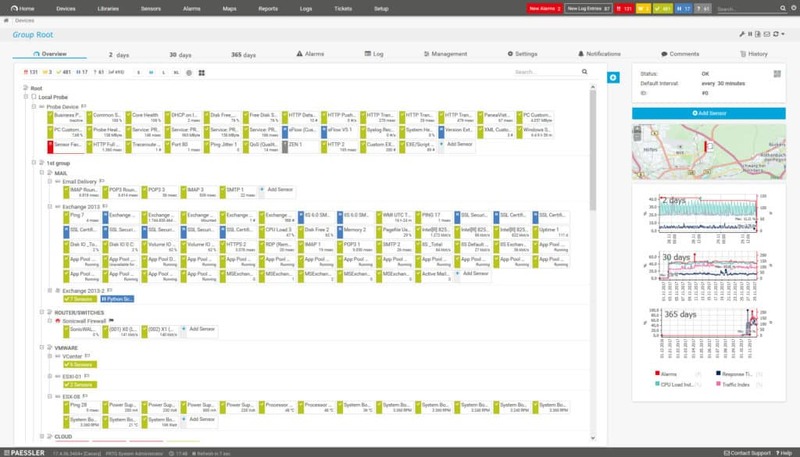 The dashboard can be personalized to include widgets and metrics of your choosing. You have complete control over the data that you see on the dashboard. For VoIP monitoring we recommend that you use the PRTG Round Trip Sensor to give you a snapshot of your VoIP call performance when you log in. The performance of your VoIP calls doesn’t need to be tracked manually all the time either. Instead, you can use the notifications system to keep you updated when VoIP calls experience poor quality. PRTG Network Monitor sends notifications by email, SMS, and push notifications. These are great because they ensure that you know the moment VoIP calls decline in quality. PRTG Network Monitor is available as a free and a paid tool. You can use the PRTG Round Trip Sensor and the Cisco IP SLA Sensor completely free of charge. However, if you want to monitor a network with more sensors then you can purchase anywhere from 500 sensors for $1,384 (£1,057) and $13,226 (£10,104) for unlimited sensors. You can download the free trial of PRTG Network Monitor. ThousandEyes is a network monitoring platform that doubles up as one of the best VoIP monitoring tools on the market. ThousandEyes correlates VoIP performance with the core performance metrics like latency, packet loss, and jitter. These are the basic indicators for seeing how well VoIP services are functioning. One of the things that makes ThousandEyes special is that you can simulate VoIP calls between agents and offices. This allows you to put your VoIP service to the test. There is also a voice test feature, which allows you to test for SIP connectivity before you initiate a TRP call. The ThousandEyes platform has been designed with troubleshooting firmly in mind. For instance, you can track infrastructure faults down to link and interface with SIP and RTP network paths. ThousandEyes operates a pricing model based on annual subscription. The pricing structure is customizable based on a number of factors like test units, endpoints, and devices. You need to contact the sales team in order to receive a complete quote. If you’d like to contact the ThousandEyes sales team then you can do so here. If you’re looking for VoIP monitoring tools designed for troubleshooting, then ExtraHop is at the top of the industry. With ExtraHop you can view the performance of VoIP calls across your entire network through the ExtraHop VoIP-SIP calls dashboard. Through the dashboard, you can see how many calls are successful or failing. There are a range of metrics that you can monitor with ExtraHop. By installing the SIP VoIP Call Dashboard you can monitor call session status, call volume, load balancing, routing call quality, and Non-VoIP protocols. With regards to metrics you can monitor, you can view active calls, call attempts, call failures, 5xx error codes, short calls, call length, and call failures. ExtraHop is also one of the most convenient VoIP monitoring tools because it allows the user to automatically discover devices within the network. The advantage of this is that you can sidestep the inconvenience of configuring your entire network from scratch. To get the most out of VoIP monitoring on ExtraHop you’ll need to download the SIP VoIP Call dashboard here. You can also try out the free trial of ExtraHop. WhatsUp Gold VoIP Monitor is one of the VoIP monitoring tools that offers a back-to-basics approach to VoIP monitoring. With WhatsUp Gold VoIP Monitor you can track VoIP performance metrics such as jitter, latency, packet loss, Capacity Planning Impairment Factor (CPIF), and Mean Opinion Score (MOS). In the event that any of these metrics falls to a problematic level, you can configure WhatsUp Gold VoIP Monitor to send you an alert. This ensures that you are always up-to-date on the performance of the network and its support for VoIP services. If VoIP calls start to experience more latency than usual, you will know immediately. When using WhatsUp Gold VoIP Monitor you’ll find that the setup process is very simple. You are taken through the installation process with a configuration wizard which helps you to set up your monitoring environment. You can configure VoIP performance monitors so that you are ready to track your network right out of the gate. WhatsUp Gold VoIP Monitor is available with a number of different pricing options. You can purchase this product with 12 months service for $995 (£759). There is also a 24 months service which can be purchased for $1,273 (£972). You can purchase WhatsUp Gold VoIP Monitor from their site. Dotcom-monitor Server Monitoring offers premium VoIP Monitoring and SIP protocol monitoring. The core focus of this product is monitoring the availability of VoIP infrastructure. 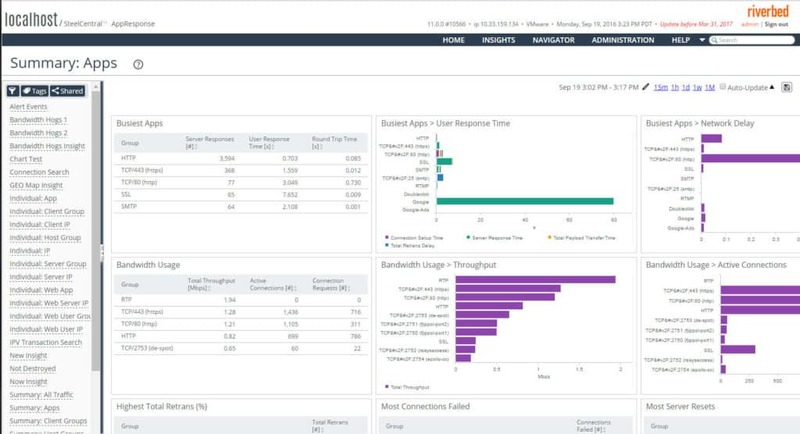 In the ServerView display, you can view outgoing call success, inbound call routing, internal extension connectivity, and voicemail availability. Similar to all the best VoIP monitoring tools, dotcom-monitor Server Monitoring has a complete alerts system. Alerts keep you notified when VoIP calls are not performing when they should. Users receive notifications when error messages are received from the server and the expected call result isn’t received. Once you’ve established VoIP calls are performing poorly dotcom-monitor Server Monitoring helps you point to the root cause. SIP Monitoring error detection records properties of the error so that you can address the root cause. 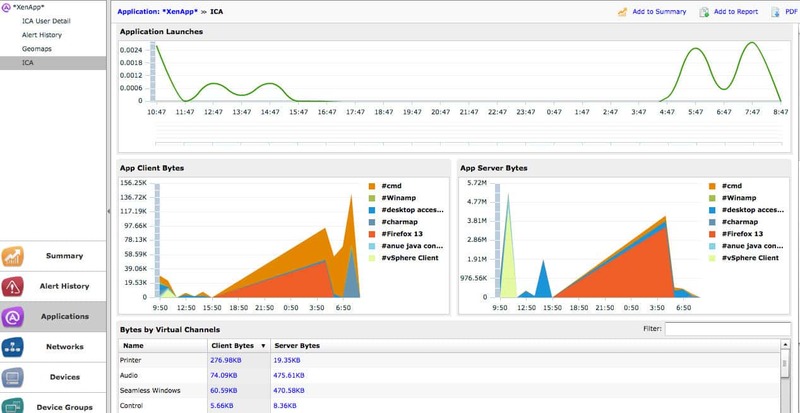 You can also generate SIP monitoring reports to evaluate performance from a distance. There are many different pricing options available for dotcom-monitor Server Monitoring depending on the number of targets set and the check frequency. Prices start from $79.00 (£60) for 10 targets and 15 minute check frequency. You can download the 30-day free trial of dotcom-monitor Server Monitoring. Riverbed SteelCentral UC Expert is a unified communications monitoring platform designed to monitor Cisco, Microsoft and Avaya environments but offers a solid VoIP monitoring experience. With this tool, you can search for calls and phones in a variety of ways. For example, you can search for previous calls that have failed or performed badly. This provides you with a reference point through which you can run further troubleshooting. All of the activity on your network is monitored through the dashboard. 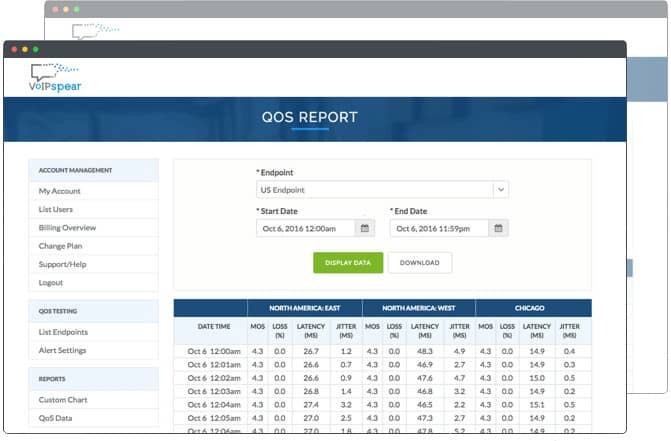 The dashboard allows you to see an overview of your calls showing total call number, short call number, percentage of good quality streams, number of call failures, and all completion percentage. Seeing your call performance in this way allows you to tell immediately if there are any problems. One of the strongest features of Riverbed SteelCentral UC Expert is the hop-by-hop media path. The hop-by-hop path shows you the path of media traffic so that you can visualize the network path of the voice traffic. This is useful for finding the cause of any problems with your network performance. In order to view the price of Riverbed SteelCentral UC Expert you’ll need to contact the sales team directly. There is also a free trial of this product which you can download from this link here. VoIP Spear is a VoIP monitoring tool that is used to track the quality and performance of voice communications. VoIP Spear has testing servers located around the world across North America, Europe, Asia, and South America. This ensures that no matter where you are, you have the most accurate VoIP call quality profile. This VoIP monitoring solution tests your VoIP call quality and evaluates call performance using Mean Opinion Score (MOS). All of this can be monitored online so that you don’t have to install any software on your device. This makes it accessible to anyone with an internet connection. VoIP Spear is one of the most competitively-priced VoIP monitoring tools on the market. There are six versions to purchase; Lite, Plus, Premium, Carrier, Carrier Plus, and Carrier Grande. The Lite version is the cheapest which costs $10 (£7.64) per month for one endpoint. The most expensive version is the Carrier Grande package which costs $250 (£190) per month for 100 endpoints. There is also a free personal plan; you can contact the company about pricing. 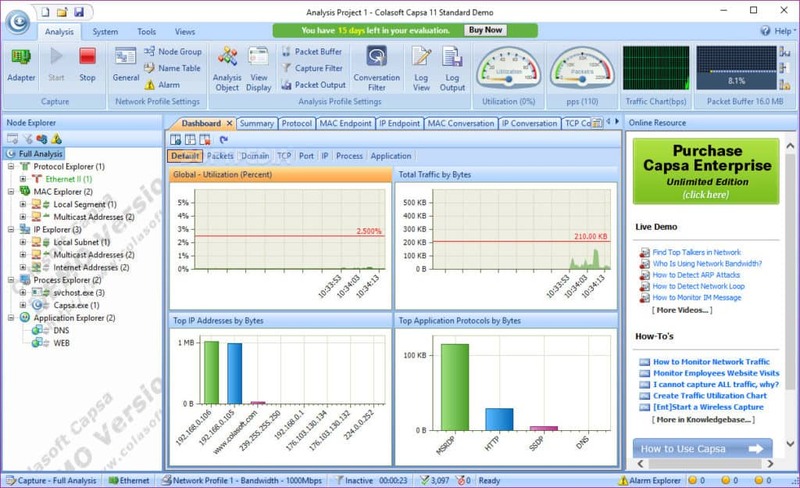 Colasoft Capsa is a network monitoring tool that has its own VoIP analysis module that can be used to track the quality of VoIP phone systems. With Colasoft Capsa you can analyze VoIP calls and view the results through the GUI in graph format. In the VoIP view, you can view metrics such as jitter, loss, mean opinion score (MOS), control flows and media flows. The majority of VoIP analysis is conducted through the VoIP Summary View. The VoIP Summary View is split into an upper and lower pane. In the upper pane, you can view the MOS_A distribution, MOS-V distribution, call codec type, call status distribution, and call event distribution. In the lower pane, you can view traffic statistics, SUP statistics, and call statistics. There are three different versions of Capsa; Capsa Free, Capsa Standard, and Capsa Enterprise. Capsa Free is available free of charge and can monitor up to 10 IP addresses. Capsa Standard can be purchased for $295 (£225) and can monitor up to 50 IP addresses. Capsa Enterprise can be purchased for $995 (£759) and covers unlimited IP addresses. You can download Colasoft Capsa here. Finally, we have VoIPmonitor. VoIPmonitor is an open source packet sniffer designed for VoIP call analysis. This tool is suitable for organizations of all sizes and has supported up to 20,000 calls on a single server. 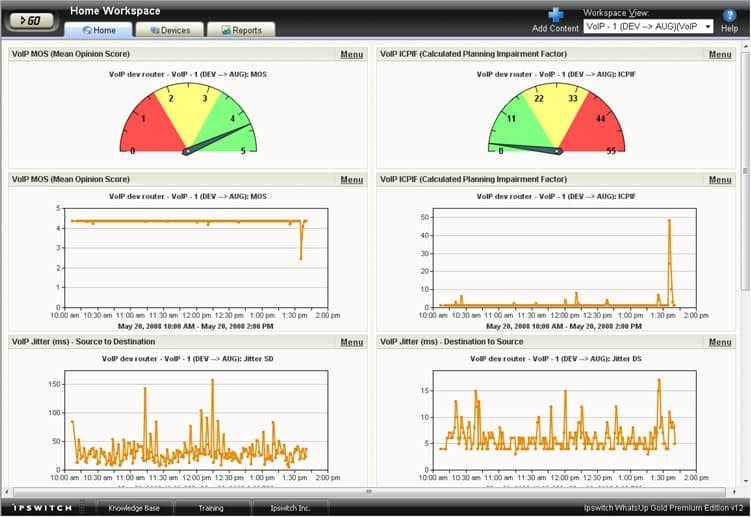 You can use VoIPmonitor as a Web-GUI and monitor metrics such as delay and packet loss. VoIPmonitor also has an alerts system that allows you to keep track of metrics automatically. For example, if Mean Operating Score, Jitter or Packet loss indicate a problem then an alert will be generated to keep you up-to-date. As an open source VoIP monitoring tool, VoIPmonitor is available free of charge. You can host VoIPMonitor on a server or in the cloud depending on your needs. You can also download VoIPmonitor as source code. You can download the free trial of VoIPmonitor here. There is plenty of competition in the VoIP monitoring tools space, but based on usability alone SolarWinds VoIP and Network Quality Manager has to be the best on the market. The setup process is simple enough that you can be up and running in less than an hour by autodiscovering devices. From then on the user interface is kept simple enough for you to find everything you need. VoIP call performance metrics like latency and packet loss are readily accessible and can be tracked through the notifications system. Whether you’re working within an SME or a larger organization SolarWinds VoIP and Network Quality Manager has the core monitoring capabilities to assist you. However, if price is your prime concern than PRTG Network Monitor is a great option as it can be downloaded for free depending on how many sensors you want to use. The PRTG Round Trip Sensor provides you with all the metrics you need to monitor the performance of voice calls. This ensures that you get to the root cause of the performance concerns the moment they occur.